Following a keto diet can put you in the mindset of always thinking you have to hack everything to turn it into a keto meal. There are some meals we know and love that are perfect just the way they are. 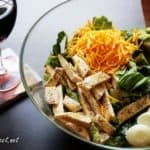 Don’t get me wrong, there aren’t a whole lot of them, but one of my favorites is the Cobb Salad. 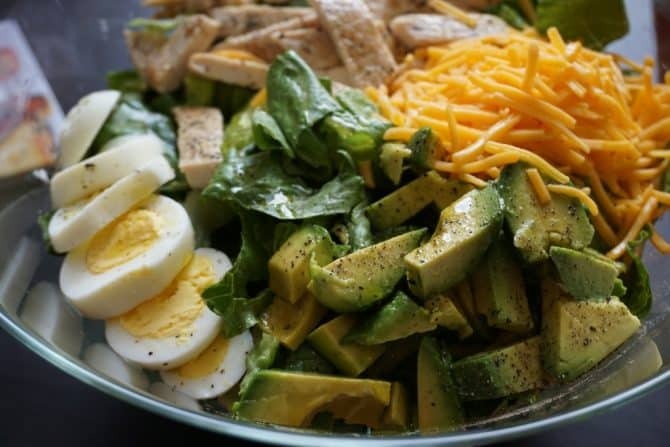 As if crafted by the Greek goddess of fat herself, the Cobb salad is the perfect keto salad. It’s got it all. High-fat, relatively low-carb, tons of vitamins and nutrients, and a moderate amount of protein. When you get invited by your coworkers on a lunch date, opt for the Cobb Salad. We’re going to keep the recipe post for this phenomenal keto salad brief since Megha shows you how to make it in this video. Now those are just the basics and everything can be either modified or substituted. I’m not going to list all the different options, but you can use your imagination. I will however discuss the dressing options. I’m a big fan of oil and vinegar. That’s really the safest and, for the most part, the healthiest option. I’ll usually use either red wine vinegar or apple cider vinegar. Those seems to have the greatest health benefits associated with them, as well as having a taste I quite enjoy. For the oil portion, I tend to switch off between three choices. The first two taste very similar and offer a pleasant, savory taste to the salad. MCT oil provides quick energy, but is mostly void of any flavor. As far as dressings off the shelf go, you’ve also got a fair amount of options there. Caesar, blue cheese and ranch are very low-carb most the time. As always, check the label. Companies will jam sugar into everything, so you never know. Most of the dressings marketed as low calorie will be almost exclusively carbs, so try to stay away from those when making a keto salad. Now, you just have to chop everything up and place it in a bowl. Megha has a magical ability when it comes to slicing hard boiled eggs. I can’t figure this one out, so you’re on your own there. Mine normally just crumble into a million pieces, but if you think you can decode her secrets, watch the “How to Make a Keto Salad” video above and be sure to tell me the secret…She won’t tell me! Lay the lettuce down first, then lay each ingredient in individual piles on top of the lettuce. 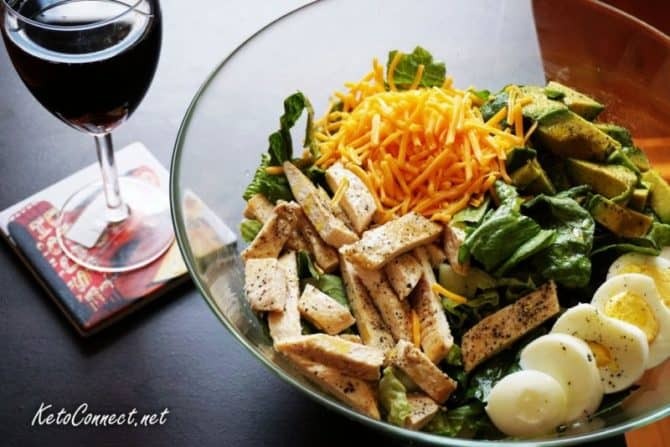 That makes it look nice and is how a Cobb salad is traditionally served. Enjoy! Start by chopping the lettuce and placing into a salad bowl. Chop all remaining ingredients and place them into individual piles atop the lettuce. Salt and pepper to taste. Add oil and vinegar or your dressing of choice. Enjoy!